Sports fans want more than just jerseys and big foam fingers. Now they're buying boots. "It's passion," said Monte Nelson, the brand manager for Fort Worth-based Nocona Boots. 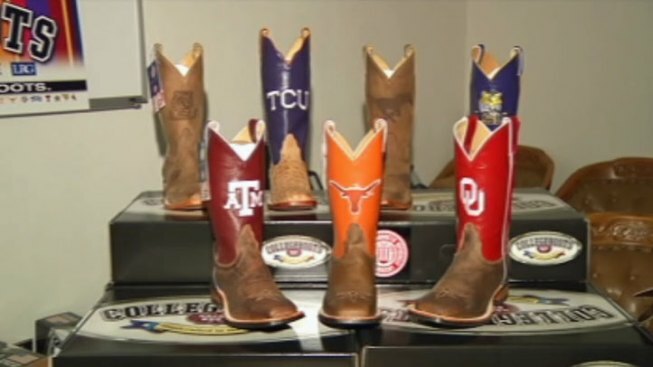 Nocona manufactures and sells college-themed boots for fans at 41 schools, including Southern Methodist University and Texas Christian University, whose sales have been through the roof. "We started with three universities back in 2009 -- Texas Tech, TCU and Oklahoma State," Nelson said. "It was phenomenal. And what we did was just grew from there. ... We've had a lot of colleges approach us now." Boot sales have quadrupled with word of the fancy footwear. And as teams become more successful, so do their boot sales, Nelson said. "Well, that old cliche -- "winning changes everything" -- well, you know, the more they win, the more they want their boots, because that passion is key," he said. Fan passion even fuels boot rivalries. Nelson said no team wants to be left out or left behind. "If TCU wants the boot, SMU wants the boot," Nelson said. "That's been great -- so, competition on the field, competition off the field."